2015 was the worst year for Spanish investment in Catalonia since 1997, the year when records first became available, according to a report from the Barcelona Chamber of Commerce's bureau for studies and infrastructure. The study shows that in 2015 --the last year for which data is available-- Spain budgeted 1.0405 billion euros for investment in Catalonia, but only spent 763 million, just 71% of what was originally planned. This percentage is the lowest for any Spanish region. The average delivery rate is 89% overall. These figures, according to the Chamber, increased the historic accumulated deficit in infrastructures. The investment by the State in Catalonia last year was 8.2% of the total amount invested regionally, a percentage far lower that what Catalonia provides in GDP (18.9%) or population (16.1%). It is the lowest percentage since 1997, according to Joan Ramon Rovira, the Chamber's Director of Studies. "The conclusions are hardly surprising, but they are very worrisome, as we have never seen such low levels of State infrastructure investment in Catalonia", stated Miquel Valls, President of the Barcelona Chamber of Commerce. Valls pointed out that the amount budgeted for Catalonia is lower than it should be according to its GDP, but in addition, "the degree of project execution is lower than Spain’s overall regional average". The president of the Chamber complained that the central government is prioritizing infrastructures like the AVE (high speed train) in Galicia, "while ignoring more productive investments like the Mediterranean railway corridor, which has suffered an obvious delay in its development". 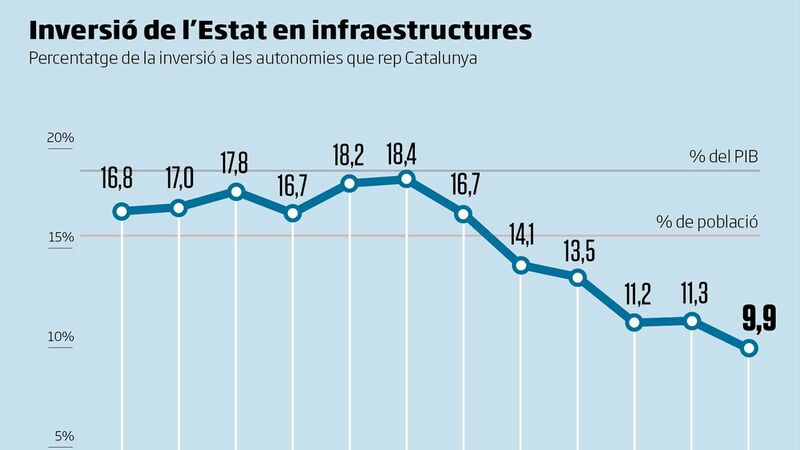 Of the total State investment in Catalonia, three quarters went to transport infrastructure projects, and in this area the degree of execution is even lower, at 59%. That is, Spain budgeted 949.5 million euros in infrastructure investments in Catalonia for 2015, but only spent 555.9 million. In fact, the almost 556 million euros actually spent accounts for only 9.9% of Madrid's transport infrastructure investments for all of Spain. According to Miquel Valls, Andalusia, Castilla y Leon, and Galicia are the regions receiving the best treatment in infrastructure investment in relation to their contribution to Spain’s economy, while those receiving the worst treatment in relation to their contribution to Spanish GDP are Catalonia, Madrid, and Valencia. The difference is that the execution in Catalonia is much lower than the budgeted amount, while in the case of Madrid the investment actually carried out exceeded what was budgeted. Valls pointed out that Renfe only executed 5.9 million euros of the 115 million forecast for 2015 in Catalonia; that is, it only spent 5% of its budget for Catalonia. In the case of ADIF, the railway infrastructure company, it only carried out 27% of its budget for Catalonia and spent 31.7 of the 118.4 million that had been budgeted. Enaire, the company dedicated to air traffic control, executed 14% of its budget, State Ports only 43%, and ADIF-High Speed 66%. Valls highlighted the lack of investment especially by Renfe and ADIF, taking into account the extensive service problems in Barcelona’s metropolitan network, and statements by the presidents of the two State-run companies defending their investments in Catalonia. Valls told them that his report is not made up of statements, but of Treasury Ministry data. Indeed, he called on the new Spanish Minister of Public Works to study the graphs presented by the Chamber to resolve Catalonia's infrastructure deficit. In addition to Rodalies, Miquel Valls also complained about the paralyzation of, or delays in, other infrastructure projects, such as the B-40 beltway highway (the so-called Fourth Belt), the Mediterranean Corridor, and the railway access to the Barcelona Port. The President of the Chamber noted that the government has only complied with the third additional clause of the Catalan Statute-- according to which the government must invest in Catalonia the equivalent of the Catalan contribution to Spanish GDP-- in one year, and not seven, as had been agreed to. On a different topic, the President of the Barcelona Chamber of Commerce also asked the Generalitat for "dialogue" in the drafting of a future Catalan Chambers law. Valls said that there has been communication from the Catalan government, but not dialogue. He made it clear that he hopes that there will be some during the drafting of the bill, for which there is now only a preliminary project. Yesterday Jordi Baiget, Catalonia’s Minister for Business, said that the law will be aimed at making the organizations "strong, useful, modern, and democratic", and denied that there is a lack of dialogue. The Chamber increased its forecast for economic growth in Catalonia by two-tenths for 2016 and 2017. According to the organization, quarterly growth will stabilize at 0.7%, and it forecasts a year-end GDP increase of 3.3%, similar to the previous year, and some two-tenths above that of the Spanish economy. Nevertheless, the Chamber president warned of the impact that a corporate tax reform could have on growth. He called this reform a "contrary measure" for economic growth, and said that it would particularly affect mid-sized companies. He noted that investment and business confidence have not shown signs of deterioration, despite international and political uncertainty in Spain. "People understand that moving their businesses forward is their own concern, not the government’s", assured Miquel Valls. For 2017 the Chamber foresees a slight economic slowdown, but less than what they predicted in previous forecasts, and now expects an improvement of 2.7% in the economy.